Last week, I took a break to visit my grandma who turned 91. If I was half as strong and vivacious at her age, I would be amazingly happy. Other than visiting my grandma, of course, it was the perfect opportunity for me to splurge on items I couldn’t easily purchase in Canada. I can’t say I did much research before I left, but I watch so much Youtube, I based most of my purchases on what I remembered was raved the most. So here are some items I purchased based on the U. S. “exclusive” calling and just some items I purchased in “I have to buy something in Duty Free” mode. It seems like I never hear a bad review about this CC Cream, so I just had to try it. It is often deemed as the CC Cream with the best coverage, and I totally agree with that. For some reason, I assumed it would be almost like a full coverage foundation, and be thicker in consistency. However, I have used it a few times and it is pretty light-weight. This is not like a Korean super glowy CC Cream that I have used to. Instead, as the name indicates, it looks like your skin, but better. I have really been enjoying quickly applying this in the morning as it also has quite a high SPF. Of course, I also had to get the other it Cosmetics cult product, which is their Bye Bye Under Eye Anti-Aging Concealer. Before purchasing their products, I didn’t know the products were created by a group of plastic surgeons with an emphasis on cutting-edge anti-aging technology. This really perked my interest as I definitely in that category where I need anti-aging. This is a thick concealer and you really need to only apply a tiny bit. I learned the hard way the first time I used it when I glopped way too much on my undereyes. The coverage is excellent. However, most importantly, I really want to find out if the anti-aging claims are true. I will update later on my blog. Buying this blush really needs no justification as it is so beautiful and affordable as well. I just don’t understand how anyone even uses it because it would totally destroy the rose pattern. As of now, I can’t tell you about the pigmentation, longevity, or application because I simply can’t bear to use it yet. From what I have garnered from reviews, this blush is supposed to quite pigmented and have great staying powder. Oh no, I can tell you one thing and that is it doesn’t really have much of a scent. That is about it for now until I can bare to use it. I stumbled onto this brand in a Sephora and I didn’t know too much about it. However, the clean and minimal packaging caught my attention. I decided to get the Coverage Duo which includes a rollerball liquid concealer on one end and a cream concealer on the other end. I thought it was quite an innovative design and would be great for travel. I have since done more research on the brand and found out that they are into using natural ingredients with minimal preservatives, which I am totally into. I am excited to give this concealer a try and report back. The last two products I purchased are more readily in Canada, but the duty free store at the airport was calling my name so I had to purchase them. Very few mascaras are smudgeproof for me, and if you put smudgeproof on the packaging front and centre, I have to try it. I am talking about the Lancôme Grandiôse Smudgeproof Wide-Angle Fan Effect Mascara. Can’t wait to break it open when I can wear makeup again after I recover completely from my ocular shingles. Next, of course, from the influence of Lisa Eldridge who is the current creative director at Lancôme, I had to try the Juicy Shaker. So far, it is has been so fun to use and the finish is beautiful and moisturizing. Do you have brands which are a must-buy when you are in the States? My only regret is that I wish I had the chance to make a stop at an Honest Beauty Store. Maybe, next time. I think the best and most frustrating things in life always sit in the “grey” area. 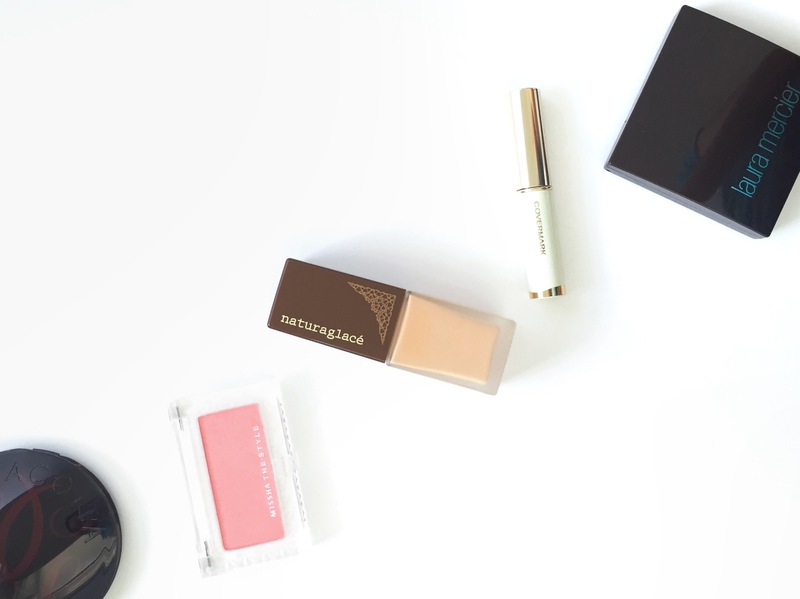 Ideally, if all beauty products were amazing and good for us, then that would be the ultimate. However, with everything in life, I find it is best to find a place of balance. For example, I tend to use more natural and organic products when it comes to skincare and body care. However, with eyeliners, I still haven’t found replacements for my favourite non-green products. Once in a while though, I find makeup items that fit that “ultimate” category and haven’t looked back. Just on a side note, I am aware green beauty is more on the luxury side, so if anyone has any cheaper alternatives, I love some recommendations. Plus, I not at all an expert on green beauty, so I am sure I missing out on some even more “ultimate” beauty products I haven’t discovered yet. 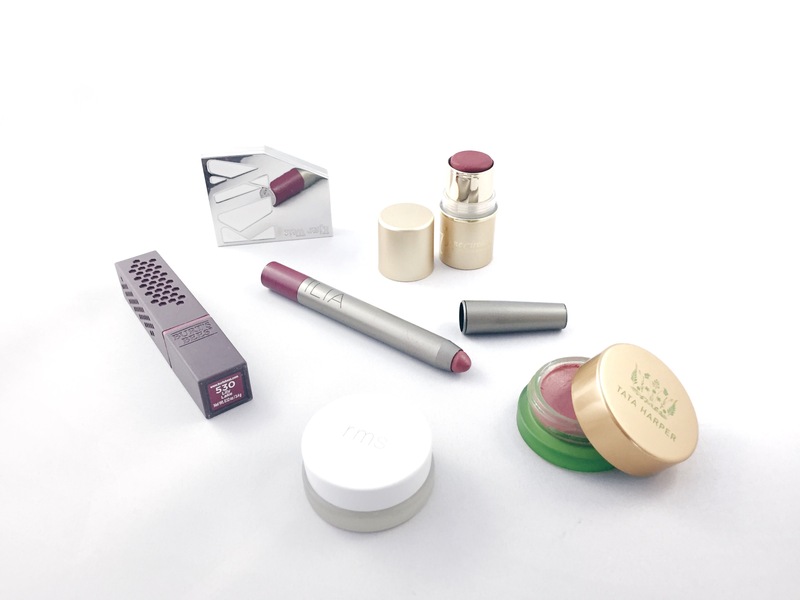 I think if you are just starting out with trying out green beauty, I think cream blush is a good place to start. I have really enjoyed all the ones I have picked up. My favourite is probably the Kjær Weis’ Cream Blush. They have a great colour selection, good pigmentation, and the packaging is beautiful and refillable. Most importantly, their cream to powder formula has great longevity and blends out beautifully. When it comes to green beauty, I think they really excel when it comes to blushes that give you that natural “I just came back from a run” flush. Wasn’t sure about the Tata Harper Volumizing Lip & Cheek Tint in the beginning because it didn’t seem that pigmented compared to other blushes I have used. However, now that I have been using it for a while, I really enjoy that natural flush it gives, and it really does plump up the cheeks, which is a plus. Lately, I have also been trying out Jane Iredale’s In Touch Cream Blush. This blush is in a stick form making application super convenient. It also gives that natural flush that I am really into lately and it smells like chocolate. For lipstick, my favourite has to be from Ilia. I started out with their lipsticks that came in their sleek matte metal tubes. I was just amazed at how creamy and pigmented they were. They give a semi-matte look on your lips and come in some beautiful colours. Then, I moved onto the lip crayons which I thought wouldn’t be as creamy because of the stick formula. However, I was surprised to find that they are just as creamy and the sharper tip allows for even more precise application. I was also going to put the Burt’s Bee Lipstick in this category. However, mine has congealed into hard clumps in the bullet after a few months. Anyone else have this problem? This is a little bit of a cheat, but for the most part, I have switched over to natural cream highlighters. Actually, I really have one, but I love it so much, I use it all the time. This is the infamous rms beauty living luminizer. As indicated on their website, this highlighter gives a “satin-pearl” sheen to the skin. This is subtle. It is not an ultra glowy Becca highlighter, but I feel it just gives the right amount of natural glow and brightens up your face. Plus, it lasts a lot longer than you think. I still see it on my face at the end of a work day. Do you have any beauty products where you have switched to green and never looked back? I would love to know. Thanks for reading! I had mentioned in my previous blogposts that I had gotten shingles. It had gotten into my eye, so I haven’t been able to wear eye makeup. I am doing fine. However, it has been killing me because it is my favourite part of doing my makeup. On the flip side, it has given me more time to focus on other parts of my makeup routine I usually forgo due to lack of time, such as contouring. Instead of just doing a quick application of mineral powder, I have been using liquid foundation. Lately, I have been loving the Japanese natural brand, naturaglacé. I have just been applying their Foundation Puree in YE2 with my fingers. It provides light to medium coverage, blurs pores and fine lines, and gives the skin a beautiful satin finish. On quick makeup days, I usually just apply a more full coverage liquid concealer. However, since I have more time, I find that doing the corrector, and then concealer step still provides better coverage for darker undereye circles. For corrector, I have used a too dark sample of the Bobbi Brown Intensive Skin Serum Concealer in Honey. This is a lovely liquid concealer that is moisturizing, doesn’t crease, and provides medium coverage. For concealer, I have been testing out the Covermark Bright Up Foundation (not sure why it is called a foundation). This is a stick concealer that provides medium to full coverage. So far, I find it provides pretty good coverage, quite creamy, but maybe a tiny bit drying. After shingles, there remains the scars to be dealt with. I had an especially bad scar on my nose and nothing really seemed to cover it well. The Nars Radiant Creamy Concealer did a pretty good job, but I had just found an unused Sephora gift card in one of my drawers (what a coincidence, right?) and decided to purchase the Laura Mercier Secret Camouflage to try. I have always see well-known makeup artist, Lisa Eldridge, use it in her videos all the time. It seemed so miraculous! So far, great coverage, and really doesn’t budge. Still loving the MISSHA The Style Defining Blusher in PK03. This is a surprising hit for me. It lasts a long time, smells great, and has good pigmentation. Well, actually, more bronzing, then truly contouring. Still not great at the contouring. I have been going back to my favourite, Guerlain Terracotta Bronzing Powder in 03. This will always be a classic because it smells amazing and just melts into your skin. For highlighting, I have gone back to old favourite as well, which is Hourglass’s Ambient Lighting Powder in Incandescent Light (Lighting Palette). I find it gives the perfect noticeable glow without going overboard. This category would never have even appeared in my everyday makeup. However, without eye makeup, I feel my face just looks kind of dead. That is why I have made a greater effort in maintaining my lip colour. I have especially discovered that lip tints are awesome! I am now beginning to understand the Korean’s obsession with them. I have been using Rilakkuma X A’Pieu’s Water Light Tint in CR01 and really enjoying the “like you have sucked on a popsicle” lip look. It has impact, but isn’t too in your face. This lip tint is quite moisturizing and lightweight. I will do a full review soon. I decided to cut my hair shorter for the summer. This comes with pros and cons. Since I couldn’t commit to cutting my hair above my shoulders, I decided to get a long lob just past my shoulders. My hairdresser forewarned me that this was probably a bad idea because the ends of my hair will always want to curl outwards at that length. He was right! The main reason I dislike cutting my hair shorter is sometimes it takes more time to style. I have stick straight Asian hair, so when it is long, I pretty much just run a comb through it everyday. Over the years, I have gotten samples of both Living Proof’s Prime Style Extender Hair Primer and Perfect Hair Day 5-in-1 Styling Treatment. I have found they are both good at extending the longevity of your style and the cleanliness of your hair. To me, I sometimes can almost use them interchangeability. However, if I could only buy one, which one would I get? The Primer claims to extend your style 2 times longer, keep your hair cleaner longer, and create a weightless shield to layer under other styling products. The Styling Treatment claims to deliver smoothness, volume, conditioning, strength and polish to your hair, keep your style cleaner and longer, and make your hair stronger. In conclusion, they both keep your style cleaner and longer. However, the main difference is that the styling treatment will obviously have other benefits such as add smoothness, volume etc. Living proof is known for the science behind their products. As indicated on their website, both these products contain their patented Healthy Hair Molecule (OFPMA) which creates a weightless shield to protect each piece of hair. I think the big difference is that in the Styling Treatment, they also include their patented Volumizing Molecule (PBAE). Both of these products are for all hair types, sulfate-free, silicone-free and oil-free and formulated for colour and chemically treated hair. The scent is described as a citrus scent. I mean, I don’t think it smells like a lemon or orange. It just smells kind of fresh to me. The scent lingers a bit the first day, but I don’t find it too strong or offensive. I follow the instructions and apply the white gel on clean and damp hair, and distribute evenly with a comb. I tried using either separately and together and I think if I had to pick, I would get the 5-in-1 Styling Treatment. For me, using them separately, they keep my hair clean for up to 3 days and rarely do I ever I have to use my dry shampoo anymore. The hair feels smooth and weightless when you run your fingers through it. I think the main reason I would pick the Styling Treatment is that it does a very good job of holding a style. I usually like the ends of my hair to curl towards my face, and with the treatment, the curl holds stronger and is more defined. The hair in general has more volume as well. The primer along with the styling treatment hold the style the longest. However, I find just with the treatment, it holds for almost as long. Even after I wake up, most of the style is in place (my ends are all curled) compared to if I didn’t use the product. VERDICT: Using both together will give the ultimate in maintaining the cleanliness and longevity of your hair style. However, if you only wanted to get one, I would recommend the 5-in-1 Styling Treatment because it pretty does it all on its own. I am not a major cushion person. Mostly, I think because of sanitary reasons. However, I am loving this Etude House Sun Blind Cushion with SPF 50+ and PA+++. Sun is the major cause of premature aging, but having to reapply sunscreen every few hours can really be a drag. Before this cushion, I enjoyed used a powder sunscreen such as Ilia’s Radiant Translucent Powder as my sunscreen top-up. However, I always wondered how much coverage you can really get from a quick powdering. So how do this cushion perform as not only as a sunscreen, but also as a top-up sunscreen on-the-go? The cushion comes in nice, sturdy packaging. I feel like this cushion is slightly thinner than the usual ones. It is only a little over one centimetre thick, so it slips in pretty easily into your purse. The blue, white, and silver design gives off a beach vibe, almost like beach cabana stripes. Lastly, the air puff inside is very similar to most Korean cushions, very smooth and dense. Like typical cushion products, the application is fairly quick. You dab the puff into the cushion gently to grab some product. Then, dab it over the face to blend the product into the skin. This sunscreen blends fairly quickly into the skin as it has a thin consistency. Since the sunscreen is white, I feel there is a tiny bit of white cast when applied, but it won’t really affect the application of your foundation. It also feels a bit tacky when first applied, but it diminishes as the product absorbs into your skin. You can check out the ingredients on their website here. The main sunscreens agents in this sunscreen are zinc oxide and titanium oxide (mineral sunscreen ingredients), which is perhaps why it gives a bit of a “white cast” when applied initially. I thought I would review all of the claims that it states this product can do for you on it’s website. Thumbs up on this claim! I don’t think it would work over mineral foundation, but it goes on well over liquid foundation. Since the formula is quite thin, you can top up a few times in a day without feeling it get too heavy. Apparently, there is also a silica powder in the formula which helps control oil, and I notice this helps mattify your face during the day to a satin finish. However, for some reason on their website, the model looks pretty dewy, which made me laugh. I guess dewy sells in Korea! This sunscreen cushion provides a coverage of SPF 50+ and PA+++. The formula is definitely thin and absorbs quickly. With regards to the UV protection, at first, I was quite skeptical that it would be effective because they always say you need a nickel size of sunscreen applied on your face for it to work. However, maybe because I reapply more, I didn’t feel like I got any darker than before. I find this cushion to be a great primer. It does subtly smooth out pores and fine lines and I do think it makes my foundation last longer. I find myself skipping foundation primer and often opting just to use this cushion as a combined primer-sunscreen. Whether it brightens skin tone, I am not sure. It is white, so it does seem to lighten everything a little when first applied. Maybe that is the brightening effect. 🙂 Now, with regards to the stickiness, I do find it a bit tacky when first applied, but after absorption, it pretty much is gone. For me, it is difficult to evaluate if it is does help stressed skin because I am wearing layers of skincare underneath. I will say it hasn’t caused any breakouts or left my skin feeling dry and dehydrated though. VERDICT: I would totally recommend this as a super convenient and effective sunscreen and sunscreen touch-up. One con is it doesn’t come with a cushion refill. Although, for the price (around $20 USD), you can’t really ask for more I guess. I love the process of putting together an eye shadow look. To me, it is almost like completing a paint by numbers picture. However, more likely than not, on my most days, I tend to just quickly throw on one eye shadow and some eyeliner. I used to keep hearing about MAC’s Woodwinked as the perfect example of an eye shadow that can create a multidimensional look. 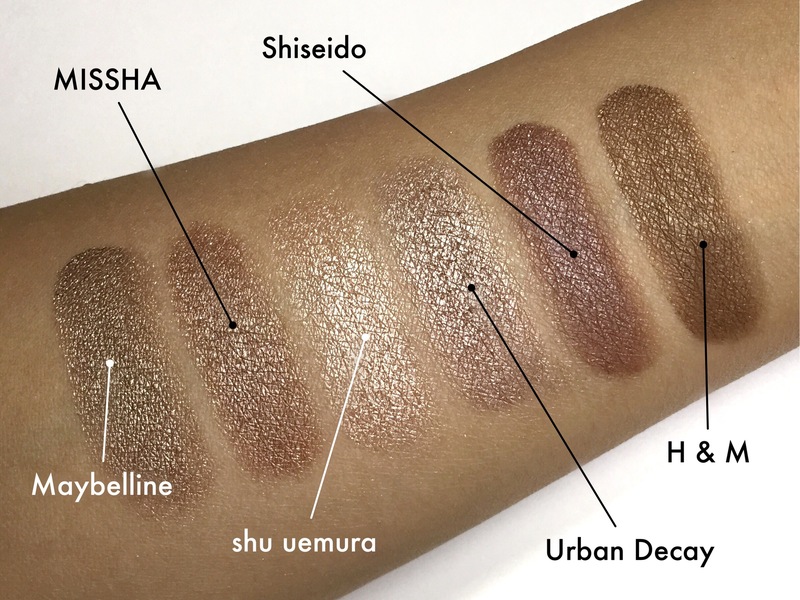 I haven’t tried it still, but the shadows I list below are my go-tos when it comes to creating a quick look patted on with my fingers or applied with a brush and then quickly blended. As you can probably tell from my selections, bronzes and browns tend to be my favourite colour for this type of application. shu uemura eye shadows tend to be a hit or miss for me. Some of the matte colours can be kind of chalky and not as pigmented, but this particular metallic shade is a winner for me. The texture is very soft and buttery, very similar to the Urban Decay shadows. This shade is a metallic bronze shade, which almost borders on being rose gold. Even though it is metallic, it is very subtle. Paired with a brown eyeliner, it makes the perfect combo for an everyday look. This was my first every blogpost and I still love this cream eye shadow. This is one of the darker colours in this blogpost, but this warm-toned brown colour makes it super wearable. This comes in a gel texture, more similar to the Maybelline 24hr Color Tattoos. I would say the application glides on even more smoothly on the lid then the Maybelline one. With primer (I always wear primer), these stay on pretty much all day and they blend out beautifully. Yes, cushion makeup also comes in shadow form. Although, I don’t feel that this is really a cushion in the original sense because the cushion isn’t picking up a liquid. It comes with a sponge applicator which dips into a powder eyeshadow in the lid. It comes with two shades, but I am in love with the metallic bronzy shade. I am just in love with how fast the application is. You untwist the cap and just dab it onto your eye and that’s it! The only thing is the shadow creases a little on me. I guess, nothing can be totally perfect. I have talked about this cream eye shadow in other blogposts, but it is still my favourite. The colour is a cool brown with a more low-key metallic sheen. The texture is kind of between a mousse and gel and great for dabbing on the eyelid with your fingers. It blends out great, and with primer, lasts all day on me. For the price and quality, this is a total winner! Last but not least, I am just going mention two favourites that I probably share with a lot of other beauty lovers. A constant standby in my makeup collection is the Maybelline 24hr Color Tattoo in 25 Bad to the Bronze. All around, considering the price and quality, this is probably the best cream eyeshadow I have tried. It has good pigmentation, blends out well, and lasts all day on me even without primer (which is a feat in itself). Another longtime favourite is Sidecar from Urban Decay’s Naked Palette. A little bit too glittery, but this taupe-bronze colour is a great option for the one eye shadow look as well. Do you have any suggestions of other eyeshadows I could add to this collection? I would love to know.